The main innovation is the body of this tagger. Now it is steel. Even the suppressor, which contains the optical system and the receiver are made of steel (previous models were not). 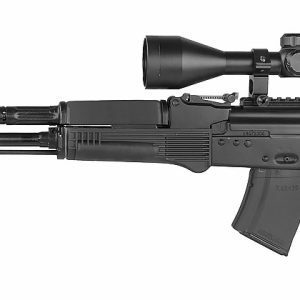 Thus, the weight of the Vintcomorez “ALPHA” has grown and become identical to the real rifle – 92 oz., and its reliability is significantly increased. In fact, it is as good as our game sets made from deactivated combat guns. In all other aspects, this new “Vintorez” has no differences from the previous versions: switching on is programmed to the vandal-proof mechanism located on the magazine; recharging is made by the bolt; the gun safety lock performs standard function.